That’s the Harmony Guide to Basic Crochet Stitches, the Harmony Guide to Lace and Eyelets (that would be knitting), and Crochet Me: Designs to Fuel the Crochet Revolution. I am really, really excited about these. I finally caved (I’d been resisting because I almost never actually use patterns, not because I didn’t want the book) and ordered the Crochet Me book after I saw someone make the Baby Doll Dress (scroll down almost to the bottom, or just Ctrl+F Baby Doll) as a shirt. I don’t know about you, but I’m not much of a babydoll dress fan (especially one that’s crocheted…out of worsted weight yarn…) but as a top it is really cute. Let’s see if I ever make it. The stitch dictionaries are just as exciting! I’ve already paged through them each twice and I’ve gotten too many new ideas to keep track of. Just the thought of designs I could make with this stitch or that – it’s so inspiring, and I can’t wait until I’m done with my current project so that I can attack something new with a clean conscience. It’s a brand-new wooden swift! It is so beautiful. I love it. (My children can never, never, never know that I have this, or where I am keeping it. They would break it, and I would cry.) I bought it from JoAnn’s online store when they sent out that 40% off coupon. What a deal! Now it will be so much easier for me to use my Gloss, and my Cascade 220, and that awesome yarn I bought in Colorado – and dyeing will be less hassle, and maybe now that I don’t have to keep it over my knees or around a baby gate, I’ll unravel a few more sweaters! I am jumping up and down over this. 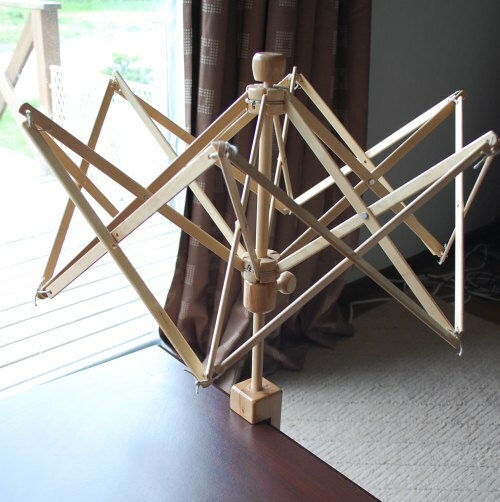 I haven’t gotten a ball-winder yet, but I don’t mind so much winding it by hand as long as I don’t have the tangles and snarling problems to contend with. I can’t wait to try this out too. 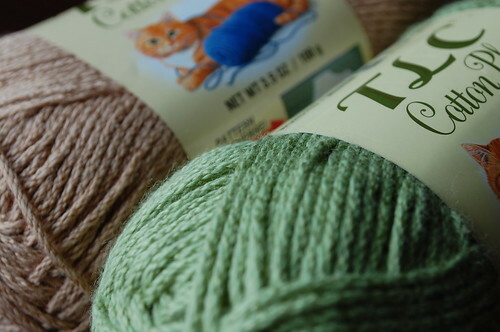 Then (because I was already ordering a package from JoAnn’s and paying for postage, and NOT adding a little something else would just have been wasteful) I ordered a little bit of yarn. 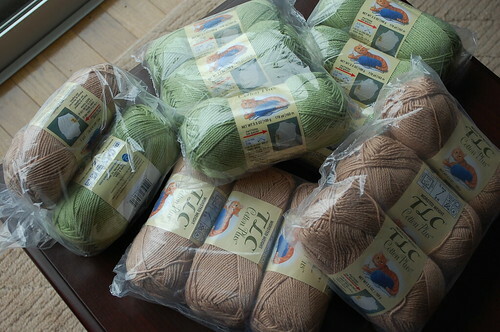 It’s TLC Cotton Plus (about which I have heard good things) and it was on sale for $2.00 a skein. That’s enough to make two large projects. YAY! I’m leaving them in their protective little baggies until I decide what to do with them – except, of course, the two little skeins that are in a bag that’s only tied, not sealed. So. Darn. Gorgeous. I haven’t decided what to do with them yet: I may make my Baby Doll Top with the Tan, who knows? I’m also thinking that I might make the Ruffled Surplice from Interweave Knits with the Kiwi. You may recall that I bought the magazine with the pattern and some yarn for it last fall at Kid n Ewe, but it looks like (big surprise) the yarn I bought is the wrong weight. Really the wrong weight. (I am not so awesome at gauging yarn weights.) So, now I have 1200 yards of gorgeous wool/silk with no pattern attached, and a lovely summery pattern with no yarn attached, and a bunch of new, cotton-blend yarn just begging to be used. This entry was posted in I Want it Bad, In Progress. I’ve heard good things about the Harmony Guides. I’m not getting any until I complete my set of Stitchionaries though. I just need the Crochet one. I’m in sore need of a crochet stitch dictionary. I have a zillion for knitting but my book stash for crochet is lacking. Which wasn’t a problem a month ago. Now I’m sucked into the wonder that is crochet and feel like I’m starting all over again! I’ve heard nothing but good things about the Cotton Plus. You’ve chosen some fabulous colors! 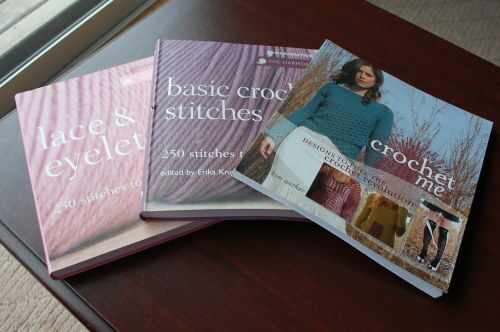 So jealous, I want a copy of the Crochet Me book. I’ve taken it out of the library and fell in love with the baby doll dress. I love the comfy cardi and the circle rug too. I love a good sale too. Never worked with Cotton Plus but it sure looks like it would work up nicely. So as spock said (loosley) the having is not so great as the wanting. Now it’s been a while – do you actually get to use your wooden swift? What did you make with the georgous yarn?